No other part of the body is as impressive as a fully developed upper arm. Today, more than ever, the trend is for ever larger arms and the development displayed in this portion of the body by many of the foremost strength athletes is truly remarkable. All these men, at one time or another, have specialized in a great variety of exercises that influence the muscles of the upper arm. You can be sure that one of the exercises that champion bodybuilders use extensively is the Two Arm Curl. In my opinion the greatest single exercise to promote maximum muscular bulk and strength of the biceps region is the curl with barbell. I am aware that there are numerous curling movements, each affecting the front of the upper arm in a slightly different manner. I recommend the trainee to include some of these movements in his routine. However it is to be remembered that the regular curl with barbell should serve as the basic exercise as it is this movement that will lay the foundation of the massive and ultra powerful arm. The wrists and forearms are also enlarged and strengthened by curling. After a session of heavy curls my forearms have increased to a “pumped up” condition of ¾” larger. This is partially due to the wrists being forced upwards and inwards as the bar is being curled to the shoulders. A strain is also directed upon the gripping muscles of the hand especially when you have graduated to heavier poundages. Some authorities claim that an overlarge biceps hinders the “lock out” phase of the overhead lifts. I am of the opinion that this belief has been magnified out of proportion. All one has to do is examine the upper arms of the world’s outstanding lifters, as all these men have outstanding arm development, including the biceps. Improper curling, such as not completely extending the arms at the commencement of the curl could cause a shortened development of the biceps which could hinder the locking out ability of the arms. However, this is directly due to improper curling technique. I feel that in some ways the well developed biceps actually helps in many exercises and strength feats. The biceps comes into play when snatching or cleaning when performing the Olympic lifts. Although the assistance given by this comparatively smaller muscle is not in proportion to that of the large muscle groups of the hips, thighs and shoulders, it is still doing a small part in regard to total pounds lifted. I have found that when resting the bar on the shoulders prior to pressing or jerking that the biceps acts as a cushion by pressing against the upper forearm. This alleviates strain from the pressing muscles by supporting a portion of the overall weight. Also, because of the compression of the biceps on the upper forearm, impetus or “spring” is given to the start of the press or jerk. On the following pages I have put down in detail the various technical assistances such as apparatus, training sets and repetitions, body positions, etc. regarding the curl. 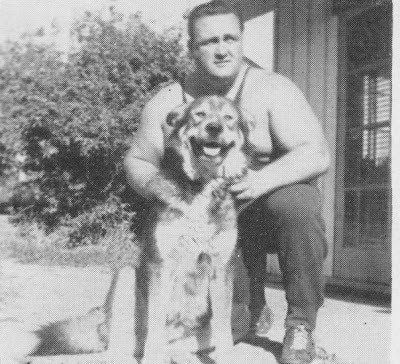 I used an identical program just prior to curling 255 pounds officially on November 1st, 1959. Follow this course as written and I guarantee that within 60 days you will exceed all your previous records in the Two Hands Curl. When specializing in the curl it is of prime importance that your training bar is of the revolving type. The regulation lifting bar is ideal as it is machined and constructed so it revolves smoothly and efficiently. If the reader does not own or have access to such a bar then the ordinary exercise bar will suffice. However, I recommend that this exercise bar be equipped with a revolving sleeve as this will facilitate the curling movement. This hollow sleeve is to be positioned on the bar and between the two inside collars. Make sure that it does not contact the collars when placing it on the bar as this will hinder the revolving process. These sleeves can be purchased at all the leading barbell distributors and are not expensive. Practically all brands of sleeves have knurling (roughened areas on sleeves) for better handgrip. Make sure that yours is of this type. If you wish you can follow this routine while using just the regular training bar minus the sleeve. You will be at a slight disadvantage when training, however, if you have access to a revolving bar when attempting a record you will be able to do just that much more. It is to be remembered that your training poundages will be slightly lower and this could retard your progress. If you are primarily concerned with attaining maximum arm size and are not especially interested in the poundage lifted a non-revolving bar will serve the purpose. Always attach the outside collars when exercising as the plates tend to shift outwards, and this will result in an unbalanced barbell. One arm is usually stronger than the other and when curling the bar will be lifted unevenly. This will cause the plates on the low end of the bar to slide outwards and off it were it not for the outside collars. If you intend to train without the revolving sleeve it is important that the outside collars are not pushed tightly against the plates when attaching as this prevents the bar from turning freely as it is curled upwards to the shoulders. The plates will be held in a stationary position and then it becomes necessary to turn the plates as well as the bar. A bent training bar can also impede your progress. I have attempted limit curls on a slightly bent bar and have failed because of this. During the upward progress of the curl the bar will invariably twist out of the grip. If you are attempting a record curl on a strange bar always check to see if the bar is bent. This is done by slowly turning the bar within the plates as it rests on the floor. If it is bent, even slightly, make sure that the bend is centered on the top before taking the grip as this will prevent it from twisting. You can easily straighten a bent bar by positioning the bend at the highest point then placing a heavy piece of wood on the center of it and hitting the wood with a heavy barbell plate until the bar revolves true. Wearing shoes with elevated heels can put you to a disadvantage when performing a heavy curl. The heels tend to throw the body forward with the resulting faulty curling leverage. This can result in the loss of five to ten pounds on your eventual limit. Always apply chalk to the hands when attempting a heavy curl, whether in training or in actual competition. This magnesium chalk can be obtained at your local drug store. Taping the extreme ends of the fingers will also assist the handgrip as this prevents the bar from rolling downwards on the fingers. As I mentioned, in the majority of cases, one arm is usually stronger than the other, normally this will be the one you favor. To attain maximum curling efficiency both arms should be of equal strength. I recommend the strengthening of the weaker arm by incorporating the One Arm Dumbell Curl into the training routine or program. If you do not have a dumbell at present you can easily construct one by purchasing a short length of steel bar or pipe from your local barbell of steel distributor. You can dismantle your barbell and then utilize the plates and collars to assemble the dumbell. Keep in mind that the One Arm Dumbell Curl is serving the purpose of an assistance exercise only and is to be used solely to increase the strength of the curling muscles of the weaker arm. Although dumbell curling will contribute to maximum size when adding the finishing touches to an already well developed arm it cannot be used as a substitute for the barbell curl if maximum curling strength and arm size is desired. Never attempt a heavy curl without first warming up. Numerous top notch strength athletes have severely injured the biceps muscle and have even torn it from its attachments because of not properly warming up. For your protection I advise the wearing of a sweatsuit when training at all times. This will help maintain the essential body heat and keep the body warm at all times. If the reader has read my other courses regarding the Deep Knee Bend and Bench Press you will remember the safety boxes and their use in the training routine. These boxes also serve a useful purpose in the curling routine. By this I mean that the bar can be placed on the tops of the boxes so that energy can be conserved as it is then not necessary to lift the bar from its low position on the floor to the starting point of the two hands curl. This procedure will enable you to make faster gains because of the energy saved and the simplicity of the primary stage of the curling movement. If you do not have the safety boxes at present you can improvise as any type of box or support will be adequate. Just be sure that the bar is elevated he correct height off the floor so that it can be removed without undue exertion. These boxes are to be used when training only so when attempting a new record the bar is to be lifted from the floor prior to curling. Place the bar on the elevated boxes and load to desired weight (starting poundage or warmup). How to arrive at this weight will be explained in detail in the next chapter. Step forward between the boxes to the center of the bar so that it is almost touching the upper thighs. You are now in position to take the handgrip on the bar. The correct gripping distance when curling is very important for if the gripping distance is too wide or close extreme discomfort in the regions of the wrist will be experienced. When first warming up it is quite normal to feel a certain degree of discomfort in the above mentioned areas as the wrists lack flexibility, this will disappear when the initial warmup is completed. You will find that the wrists become more flexible as you progress and eventually you will experience little or no discomfort when first warming up. Don’t worry if the wrists are sore for the first two or three days after you commence this specialization routine as this is a natural occurrence as the wrists must adjust and strengthen to meet the demands put upon them. The gripping distance regarding the curl will vary with the individual so to find the distance suited to you hold the barbell just as you would when first preparing to curl (arms completely extended at the sides, hands in the palms up position and the body completely erect). Now position your hands on the bar so that they are almost in contact with the sides of the upper thighs. You will notice that when you have attained this position that the arms will hang almost vertically to the floor. This position of the arms will give you the greatest leverage when curling. It would be a good idea to mark the bar with either chalk or adhesive tape so as to show you where to place the hands. In this way you will always have the right handspacing and this will eliminate repositioning the bar after you have lifted it to the starting position of the curl. When marking the handspacing on the bar first check to see that the bar is balanced and that the marks are the same distance in from the extreme ends of the bar. If you are out even as little as half an inch this will throw extra strain on one arm, this will probably result in a failure with a limit attempt curl. Take the grip and make sure that the bar is positioned well up in the palms of the hands (towards the wrists) as the closer to the wrists the better the curling leverage as then the bar will be closer in to the body at the difficult halfway stage of the curl. Concentrate on gripping the bar as tightly as possible throughout the entire curling movement. Just before removing the bar off the boxes (or the floor, whichever the case may be) inhale and then quickly lift it to the commencing position (do not attempt to walk out from the safety boxes, conserve your energy for the actual curl). The arms should be at the sides and the hands close to the sides of the upper thighs. The feet should be spaced approximately fifteen inches apart at the heels (this applies to those of normal height, if you are taller or shorter than average then adjust the spacing of the feet accordingly). The legs should be completely extended and the knees locked (this is accomplished by thrusting the knees as far back as possible). This assists in maintaining the upper body in the erect position throughout the entire curl. It is imperative that the body be in an erect position at the start of the curl not just from the standpoint of disqualification when lifting competitively but also to utilize maximum curling leverage. To overcome the tendency to backbend at the crucial halfway point of the curl the head is to be positioned so that the line of vision is at a 45-degree angle towards the floor and is to be kept in this position throughout the complete curling movement. It is to be understood that the above body position is to be assumed BEFORE commencing to actually curl. The time element is of prime importance when curling (as it is in all competitive lifts) so position the body as quickly as possible and as soon as this is accomplished commence to curl the bar to the shoulders. The quicker one can combine and coordinate the first phase for the curling movement the more vital energy is saved and utilized for the completion of the lift. However, regardless of how quickly the body is positioned do not attempt the actual curl until you have prepared yourself mentally for the effort. Actually, this should be done before lifting the bar from the floor or boxes. The longer you hold the bar at the commencement of the curl the less energy you will have to start the initial curl phase. I believe that the starting point of a lift is all important as it is here that success or failure is decided. If any lift, especially a limit one, is not started correctly it is already lost. The three main factors that influence starting power are: (1) correct body position, (2) proper concentration, (3) speed of muscular reflex or explosive power. Those that think that strongmen are physically slow are daydreaming as speed of reflex is absolutely essential when performing a strength feat. This quality of muscular reflex is, without exception, possessed by all champion lifters. This fact is highly important and I would like the reader to bear this in mind when in training or competition. When curling, especially when performing single repetitions, concentrate on starting the bar with all the power at your command. It is a scientific fact that the faster an object moves from its stationary position the less it will weight when in motion and opposed to gravitational pull. Another important point to keep in mind is that once you have started the bar with the greatest possible speed you must strive to maintain this speed throughout the complete curling movement. If you let up, even for a fraction of a second the bar will immediately lose momentum and when it reaches the sticking point serious complications will arise. Even more so in the case of the curl as it is extremely difficult to fight a curl without back- bending and this, as you know, is cause of disqualification when curling competitively. After starting the bar strive to keep the elbows well in at the sides. The elbows should move forwards and upwards as the bar is progressing upwards but they should not move away from the sides as this will cause faulty leverage. Better leverage can also be attained by forcing the hands and wrists inwards (as you would when wrist curling a bar) during the upward phase of the curl. A common error is to start the curl with the arms slightly bent at the elbows. This is detrimental for two main reasons: (1) If this is continued for a period of time the trainee will usually find himself incapable of properly straightening the arms. If the term “musclebound” has any meaning I am inclined to believe that this physical disability would be an example of it. (2) There will be a loss of vital starting power as the curling muscles are not used to full advantage. Few persons are aware of the fact that the front of the deltoid muscle of the shoulders plays an important part in the execution of the two hands curl. This muscle comes into play at the approximate half way point in the execution of the point of the curl and if used to its full advantage it can increase the limit attempt many extra pounds. How I discovered this fact was that on several occasions I eliminated the curl from my training routine for a period in excess of four months. This was due to specialization on the three Olympic lifts. As you know these lifts directly influence almost all the muscles of the shoulders, especially the deltoids. I found to my surprise that when I again included the curl in my training program that I could almost equal my previous best curling performance. When the bar reaches the halfway point in the curl the elbows are thrust forwards and upwards, this will allow the deltoid muscles to come into play. This movement must be coordinated with the first phase of the curling movement. As you progress in your routine you will become increasingly proficient at “shifting gears” as it were and thus utilize all the muscles involved in the curl to their fullest advantage. 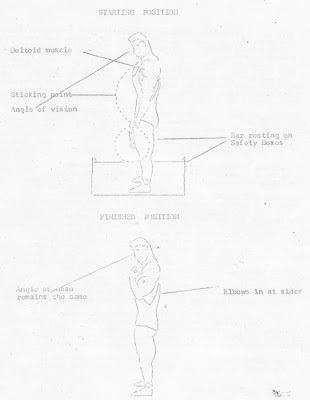 The illustrations given show the starting and finished positions of the body when curling. Study these diagrams closely as this will enable you to understand more fully the mechanics of the curling movement. The breath is to be held from the commencement of the curl until the bar passes through the halfway or sticking point and exhaled as the bar is positioned at the shoulders. Do not under any circumstances exhale until the bar has passed through the sticking point as deflating the chest in the early stages of the curl will severely handicap efficiency. Always breath via the mouth as the nose is not equipped to take in or expel large amounts of air in a short time. Do not worry if at the completion of the curl that you are not able to rest the bar on the upper chest. Some persons arms are so proportioned that it is extremely difficult, often impossible, to contact the chest with the bar. This will not hinder curling efficiency. I am unable to rest the bar fully on the chest but I still managed to curl 255 pounds officially for a worlds record. The Two Hands Curl does not fall into the category of the “heavy exercises” such as the Squat, Deadlift, Bench Press etc. due to the comparatively small muscle group involved and the resulting lighter poundages lifted. For this reason less time is required for recuperation. The following routine can be performed every second day if the trainee so desires. However, three workouts per week will give fast and lasting results. In this program as in my others I have combined single repetitions with sets of consecutive repetitions. This method of training will develop both maximum muscular bulk and strength in the muscles involved. This following training routine is also designed basically to promote above average curling ability. By this I mean that the trainee will lift poundages in a strict and accepted manner. There is a vast difference between this and the loose method of curling known generally as “cheat curling”. Many persons think that “a curl is a curl” regardless of style. Do not let this belief detract from your training. In a short period of time you will find that you are curling more in a strict manner than most others can cheat curl. If you wish, at times, to include a few cheating curls in your training routine this will do no harm but keep in mind that your primary goal is performing he curl as it should be done. Warmup with a poundage that you can handle comfortably for five CONSECUTIVE repetitions, make sure that you are not overworking with this weight. Then increase the poundage so that ONE SINGLE REPETITION can be performed without straining (rest approximately 3 to 5 minutes between all sets and heavy singles). Increase the weight again and then perform another heavy single (the trainee should be working harder now but not overstraining). Increase the poundage once more and perform FIVE SINGLE REPETITIONS. When you have found the weight that can be handled for the required 5 singles stay with this poundage and strive to increase the amount of singles each following workout until EIGHT SINGLE REPS can be performed. When this is accomplished increase the poundage so that a minimum of 5 singles can be done and again, as before, work up to a maximum of 8 singles. When the 8 singles can be performed increase the poundage so that 5 singles can be done, work up to 8, etc. etc. When performing heavy singles it is important not to train too close to an absolute limit poundage. Always hold something in reserve as this practice will help prevent muscular staleness. If the trainee can make a gain of 1 single each training period this shows a good gain, don’t expect to do more. However, if the trainee finds that he can perform 2 or 3 extra singles then by all means do so. This completes the single repetition portion of the Curl training routine. The second part of the routine consists of a series of sets of consecutive repetitions. This will stimulate muscular growth and increase the recuperative ability of the body. Load the bar to a poundage that FIVE SETS OF THREE CONSECUTIVE REPETITIONS can be performed with. Stay with this poundage striving to increase the amount of repetitions each following workout until FIVE SETS OF FIVE CONSECUTIVE REPETITIONS can be performed. Increase the poundage when the prescribed number of reps and sets can be performed. A minimum of 3 reps for 5 sets should be done when first starting. After completing the above routine the reader should be able to tell as to whether or not one arm is weaker that the other. If the curling strength of the arms is unequal it is then necessary to strengthen the weaker arm to increase overall curling efficiency. The Dumbell Curl is an ideal assistance exercise to aid in increasing the curling power of the weaker arm. Load the dumbell to a poundage that can be curled a minimum of 3 consecutive reps with the weak arm. Continue with this poundage until 4 sets of 5 reps can be done with this arm. Increase the poundage in the same manner as outlined above in the curl routine. The assistance dumbell exercise is to be applied to the weaker arm only, so that a balance of curling power is acquired. This completes the curl routine. Don’t perform more sets reps than what is prescribed, doing too much is just as bad as doing too little. This routine can be performed three times per week, more than this is unnecessary. Due to the many requests I have received for personal assistance regarding training problems, diet, staleness, etc. I have decided to devote my full time to a Personalized Correspondence Course in which I will PERSONALLY supervise those who wish to take advantage of this offer. Because I can now devote full time to this Correspondence Course all letters will be answered in detail and returned promptly via air mail. You may send as many letters as you wish. All your personal problems involving the acquisition of health, maximum strength, muscular bulk, etc. will be under my PERSONAL and PRIVATE supervision. This offer will be extended to a limited number only. The full price for the ONE YEAR course will be only thirty five dollars. Document courtesy of R. Weaver.